The Swedish sculptor and installation artist, Lars Mikael Genberg (1963), is renown for the alternative living spaces that he creates. Mostly taking inspiration from Sweden's traditional red farm houses with white trim, Genberg has created an unusual line of hotels in Sweden. Hotel Hackspett was Genberg's first alternatively designed place of lodging, right in the center of the city of Västerås – in the branches of a 13-meter-tall oak growing in Vasa Park. Hotel Utter Inn, on the other hand, is an underwater hotel in Mälaren Lake. Upon first look, the building floating on top of the lake looks exactly like a traditional Swedish farm; but what you don't see is the rest of the hotel, the part that plunges three meters under water. It must be mentioned that the room in which guests can overnight (in romantic solitude) boasts a 360º underwater panoramic view. The apocalyptic project Hotel Oops is another “typical” Swedish house with white window frames, except for the fact that it's partly submerged under Mälaren Lake. Continuing with Genberg's next project, we come to Pemba Island, part of the Zanzibar Archipelago and very near the Tanzanian coast. The Manta Resort's Underwater Room is the second of these underwater spaces and part of the Hotel Utter project. Located twelve meters under the surface, the encapsulated quarters are surrounded by turquoise seawaters and tropical reef fish lazily swimming around. Naturally, Genberg has the following credo: “Everything that is impossible can be made possible, and only the person himself sets the boundaries of possibility.” Over the last ten years, Genberg has been developing a literally fantastic plan – just as he has already made park trees, lakes and even the ocean inhbitable, he now wants to pointedly change the landscape of the Moon. In 2009 Genberg hauled a prototype of the classic red Swedish farmhouse onto the domed roof of Stockholm's Globe Arena. This action could be symbolically taken as his first attempt at approaching what could be the greatest utopian dream of his career – getting a red house onto the Moon. Since the 20th century, outer-space has been accessible only to a specially-trained elite, but the Moon – to our eyes the largest unobtainable heavenly body – has been inspiring artists to create since time immemorial. In this century – more precisely, in 2002 – the British artist Damien Hirst sent a miniature of one of his famous colored spot paintings to Mars. Success, however, was not to be had; the British landing spacecraft lost communications with its base station before it managed to land on the red planet. Another approach to claiming the surface of the Moon began in 2013, with a project by the artists Ai Wei Wei and Olafur Eliasson. 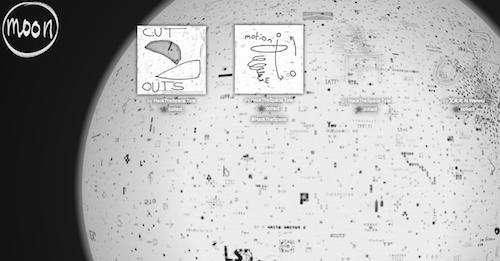 The interactive website moonmoonmoonmoon.com allows users to create graffiti or some other visual signature on the surface of a virtual Moon. Last year even Sarah Brightman, the popular music prima donna, announced that she will be taking a trip into the cosmos in 2015; this has been officially confirmed by the Russian space agency. And now the Swedish artist Genberg, with financial support from the public, is working on his long-cherished project, “Moonhouse” – the first art project on the Moon. It is the only such lunar project that is so close to becoming a reality. Genberg's vision may not be the most exciting work of art to have ever been created, but its trip to the Moon will certainly outdo a regular gallery show. The goal of the “Moonhouse” project is to democratize the study of the cosmos, to overcome spiritual barriers, and to expand people's understanding of what is possible. A red house with white trim will give some life to the sterile landscape of the Moon. According to the published information on the project, the installation will have a base area of six square meters and will be two-and-a-half meters tall – large enough to house one adult. The total weight of the installation, including support elements, will be ten kilograms – which is just 1.7 kilograms when adjusted to the gravity of the Moon. The total costs for this ambitious project hover somewhere around 15 million dollars – five million for the technical/engineering aspects of the installation itself, and ten million for a one-way ticket to the Moon. It takes four days to cover the 384,000 kilometers to the Moon! Every publicly donated dollar will help “Moonhouse” get 25 meters closer to its goal. On June 2, the project's Facebook page posted the following: “The Moonhouse has now reached outer space! Thanks to everyone who has contributed.” Based on the amount donated so far, the “Moonhouse” is now 100,000 meters above sea-level.